[09 December 2012] Earth from Space: ESA's Web TV series featuring Earth from Space is just nice to watch. See, for example, the Friday, December 7, 2012 feature on the “Yellow River, Sea and Sand”. [15 November 2012] I have moved to Africa: Since 1 November 2012, I am at the University of the Witwatersrand, Johannesburg, South Africa. After having it done now five times, unpacking a new country is still exciting and full of challenges. And South Africa is in many respects different from the other countries I have unpacked so far. [24 November 2011] Fourth IGCP 565 Workshop took place in Johannesburg, South Africa: The fourth annual Workshop of the IGCP 565 Project was held on November 22-23, 2011 at the University of Witwatersrand in Johannesburg, South Africa. The workshop was co-located with the AfricaArray workshop, which took place on November 20-21, 2011. 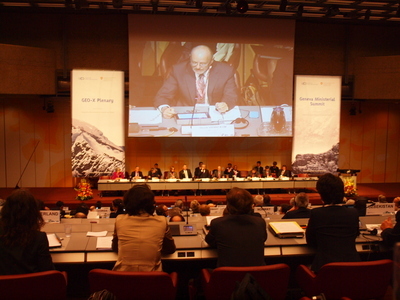 A joint session was organized on the afternoon of November 21, 2011. The IGCP Workshop focussed on Support for water management through hydrological models and data assimilation. For more details the here. 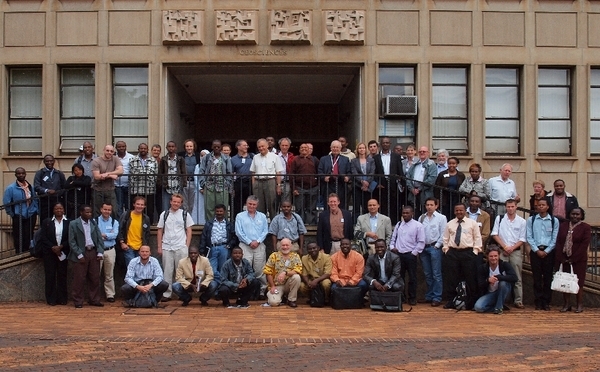 Participants of the IGCP 565 Project Workshop and the AfricaArray Workshop. [1 November 2011] IGCP 565 Workshop in Johannesburg: The fourth annual workshop of the IGCP 565 Project “Developing the Global Geodetic Observing System into a Monitoring System for the Global water Cycle” (web site) will be held in Johannesburg, South Africa, on November 21-22, 2011; see the Workshop page or the Detailed Program. [18 October 2011] Program of ESF Conference on major geohazards available: The detailed program of the European Science Foundation (ESF) conference titled “Understanding Extreme Geohazards: The Science of the Disaster Risk Management Cycle” which will take place on November 27 to December 2, 2011 in Sant Feliu de Guixols, Spain, is now available. See the Program or the Conference Pagefor more information. [8 June 2011] Major Disasters addressed at AGU: At the 2011 Fall AGU in San Francisco, there will be a session on “Characterizing Major Disasters Caused by Geohazards”; see the Announcement for more details. [23 March 2011] IEEE has a very informative blog on the Japan earthquake and nuclear energy: read more .... In particular, I like the contribution by Bill Sweet (posted Sat, March 12, 2011), who wrote: Worst-case scenario builders consistently underestimate the statistical probability of separate bad things happening simultaneously, as the result of the same underlying causes. This is true for all worst case scenarios we built, not just those related to anthropogenic disasters. [21 March 2011] GEO Newsletter reports on CZCP Workshop: The GEO Newsletter published today includes an article on the 3rd regional Workshop of the CZCP, which took place on March 9-11, 2011 at the Sheradon in San Juan, Puerto Rico. Read the Newsletter ... Read the Workshop article ... The picture in the article of the North Coast of Puerto Rico was taken by me on Saturday, March 12, 2011.